A lively march and lobby organised by the National Shop Stewards Network Anti-Cuts Campaign marched to Labour's Local Government Conference in London today. At the same time, the NSSN also helped organise a march of nearly 2,000 in Cardiff to demonstrate outside the Tory and Liberal Democrat Spring Conferences. A short rally was held as the London march assembled next to the Imperial War Museum. I was able to point to the attacks from councils across London - predominantly Labour-controlled - on education services. I joined other trade union speakers in calling for co-ordinated strike action to fight the attacks on pensions, jobs and services. The news that NUT members in Tower Hamlets had voted to take borough-wide strike action to protect central education services was applauded. As the march made its way towards Westminster, the main slogans were against Con-Dem Cuts - but also a message for Labour Councillors: 'No ifs, no buts, don't pass on Tory cuts'. When we got to Transport House for the lobby, a few Labour Councillors sneaked outside to hear fiery speeches from Steve Hedley from the RMT and Socialist Councillor Dave Nellist. Eleanor Donne also spoke to mark International Women's Day on March 8th, pointing out how it will be women who bear the brunt of cuts and privatisation. March 26th will be much, much bigger but today's event still put down a significant marker. When some TUC leaders try to send marchers away from London on the 26th just with the message 'Vote Labour' to defeat the Con-Dems, they must be answered - that's not good enough! 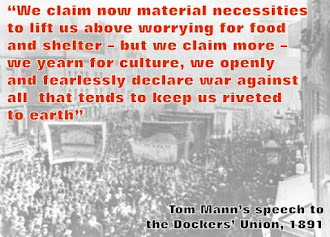 If Labour Councils - and any future Labour Government - are going to simply carry out the same policies then we have to build a real alternative - both through mass action by trade unions and local communities - and at the ballot box through building a real trade union and socialist challenge to the main political parties. The election of five socialist and left TDs to the Dail in last week's Irish General Election shows what can be achieved. It's time to build the same challenge here in England and Wales.